I’m married to man who is half Italian and half Spanish. So, you know, he loves to cook. I’ve been growing rosemary, basil, oregano, and parsley by our kitchen door all summer long, cutting fresh herbs as-needed for cooking. This morning, I decided to pinch off some herbs for a fresh herb infused oil that we can use for cooking, salads, and who-knows-what-else. I’ll be drizzling this oil over some garlic and rosemary-roasted potatoes, adding it to a tasty salad with fresh-squeezed lime juice, maybe even using it in place of my regular olive oil when I cook chicken or steak to go over my salads. Hmmm…. Once again, head to Costco. Buy an absurdly large bottle of extra-virgin olive oil. 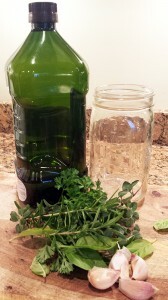 Chop fresh herbs (leave mostly intact), grab a few cloves of garlic and a pint-sized mason jar. Stuff herbs and sliced garlic into the jar. Add oil to cover herbs. Use after a couple of days. Store in the fridge for up to a month. If you’re using fresh herbs for your herb infused oil, you’ll want to keep this oil in the fridge. When you introduce water into this kind of mixture, the oil can go rancid, and fresh herbs have water. So start using it right away. I’d give the infusion a couple of days to get the flavors going, and then start using the oil. 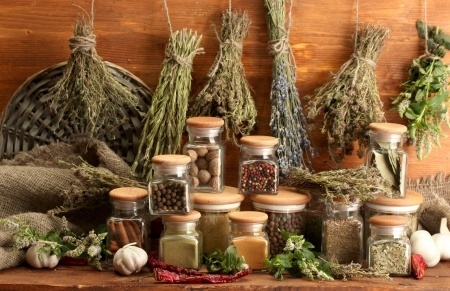 If you want to go the route of creating an herb infused oil in the pantry over the course of a month, then make sure you used fully-dried herbs and make sure that your jar is sterilized, and completely, totally dry. You can use any combination of herbs that you want, or just go with a single-herb oil like a rosemary-infused oil or a garlic-oil. 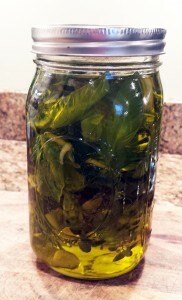 An infused basil oil creates a gorgeous green oil that has so much basil flavor, you’ll practically want to drink it. Clip fresh herbs from plants. 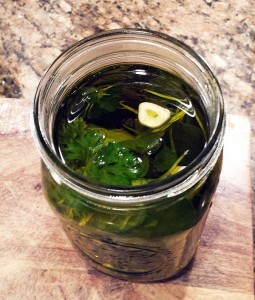 Place herbs and garlic into mason jar. Pour oil over herbs and garlic until covered. Infusion time: 1-2 days Store in the refrigerator for up to a month, then discard. How easy and delicious. I need reminders about this simple kitchen stuff. This would be awesome poured over steak with some lemon juice as a post-grilling marinade. Laughed at the first line of your post since my Dad is half Italian, half Spanish Basque/Mexican and also loves to cook.